Is there any evidence for neurons existing within other neurons in humans or other organisms? From what little I've learned about physical neuroscience while learning to build neural nets, I don't see how one neural cell could actually contain another, as a nested structure implies; on the other hand, I figured I'd ask, because neuroscientists have discovered such a wide variety of neuron types, exhibiting all kinds of fascinating behaviors and structures. Furthermore, I suppose it's conceivable that the complex firing of neurotransmitters might be interpreted in a hierarchical way, akin to nested neurons. The reason I'm asking is entirely practical: I've recently discovered that there may be certain advantages to treating neurons as nested structures when performing data and object modeling of neural nets. I'm interested in finding out if such nesting could be biologically plausible and if so, how I could go about finding more information on the topic. I've performed Internet searches and looked through the threads at StackExchange and can find nary a reference to the term "nested neuron." I'm asking whether neuroscientists currently possess any evidence for biological nested neurons. It's a very simple yes-or-no thing; either professional neuroscientists have such evidence in hand or they don't. Is there any evidence for neurons existing within other neurons in humans or other organisms? from a practical, biological point of view is no. The strongest argument against the neuron embedded (I'll deliberately not say "nested" as it has a computational and statistical taste to it) in another neuron is: I've never heard of it. I could cite every single neuro textbook I have not mentioning the phenomenon, but I'll wager that doesn't make too much sense, hence this unreferenced argument. Neurons need a membrane potential to operate, e.g., to fire action potentials, or change their membrane in a graded manner. That membrane potential is, with perhaps an exception or two, always negative. That is, inside negative, outside neutral. A neuron within a neuron would provide inhospitable living conditions for the former. The latter wouldn't be too happy either. The former will not be able to build up the normal gradient of high Na+ outside the cell, and a high K+ inside, as the enveloping neuron would try to do exactly that same thing. The inner cell would thus build up a gradient (push Na+ out) and the enveloping cell would again transport the Na+ out. For K+ the reverse would happen (see Na+,K+-ATPase for background). In short, the inner cell would not be able to build up a membrane gradient, while the outer cell would have to deal with a pesky parasite messing up its ionic homeostasis. The inner cell would die, as many processes vital to the cell need a gradient (ion transport of nutrients along the membrane, disposal of garbage) and the outer cell would then finally be a happy neuron, barred the debris in its insides. Physically embedded neurons don't make sense. Simply, because neurons exist, basically, to convey information from one neuron to the next. The textbook example of a neuron (Fig. 1) has an input part (the dendritic region), a space-traversing part to cover distance (the axon) and an output part (the axon terminal). Any processing occurring within the neuron is done primarily by logic operators such as summation, subtraction and integration (through the dendritic tree collecting information) and gain control (inhibitory or excitatory influences in dendritic region, cell body or axonal part). But in the end, a neuron is designed to get information from A to B. Therefore, a neuron within a neuron doesn't make sense from a neurophysiological vantage point. Fig. 1. Textbook example of a motor neuron. 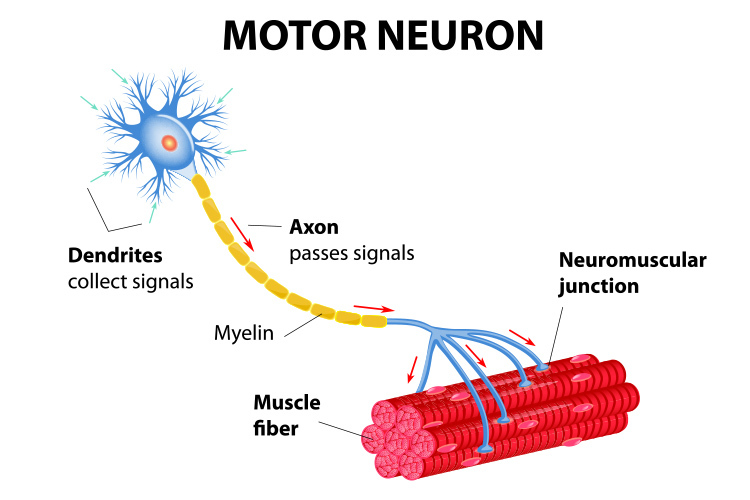 The neuron receives information from higher motor areas in the dendritic region and stimulates the muscle using action potentials. Rate code is used to regulate the strength of muscle contraction. source: Obes DVR Lists. New membranes are produced by a process during divisions as you read in genetics; sometime calls embryogenesis.It is just the divisions of cytoplasm. The layer than separates nuclides are suggested to polarize toward nuclides inside a single cytoplasmic they all are. So, as it might be guessed by the definition of the word "cell", normally in final form of a tissue there will be no cell inside a cell (or its cytoplasm). They will be split into two cells, as always in science this is what "usually" happens (This article provides some backgrounds on how this mechanism works). There are however vesicles, simply bags of some chemical stuff (e.g. neurotransmitters). They fuse into the cell membrane at its terminals and some N.t. would be released. They are not living cells though, but their outside layer is similar to the ones in a real cell, made in form of phospholipid bilayer. Rather than neurons, there are some more cells in the nervous system, called Glias, even more than neurons. Their main role seems to support neurons and synapses. You may think of them as supporting cells, joint with a neuron or a synapse helps them being activated or deactivated. There are recent studies, investigating the role of Glias in the brain. Neurons (for example in cortex, which is the most influential area of the brain interested computer scientists) do not perform activations alone. But they form a network; in fact networks of networks. In cortex, they together form columns, super columns, and in human around 6 layers. They usually study groups, columns or bigger forms of interconnected neurons, except in invasive single neuron imaging techniques. So neurons have been in some sense studied doing computations "on average", but not alone. Even the activation in neurons (action potentials) are generated at a place called axon hillock, that does not rationalize having two cells can simple generate two independent signals and then merge them together; this can be done easier at synapse level since nature is just a sloth and select best random outcomes. Synapses are where information is stored in artificial and natural neural networks. So even a cell within a cell (connected), does not provide further improvements (like new trends of providing computing power necessary for deep nets). By cell-within-cell in ANNs you just add another connection and possibly a new layer. You can do the same by defining new layer as in deep networks. Action potentials to send signals of activation forward in cell are performed and developed in places outside the cell body (soma). There are usually occurs in dendrites and mostly in axons. So biologically speaking. A cell body within a cell body does not help or intervenes in computations or for communication. If it happens in real world, there are just mutations, or wrongly or in-lab developed ones (It is possible, right? ); similarly other solutions perform same mechanism, for example like a single neuron, or two connected neurons normally through a single synapse. Though the idea could be investigated by self-similar systems (fractals), dimension of self-similarity measures, dynamic systems, and in general chaos theory. In neural system this fractal dimension is an integer at cell level (a single cell). You can however study how this self-similarity works for artificial neural nets :-). As the other answers point out, there is no such thing as a neuron inside another neuron, i.e. a literal nested neuron. Local supra-linear summation of excitatory inputs occurring in pyramidal cell dendrites, the so-called dendritic spikes, results in independent spiking dendritic sub-units, which turn pyramidal neurons into two-layer neural networks capable of computing linearly non-separable functions, such as the exclusive OR. This means that the neuron behaves as if it had many nested subunits, which are in fact only branches of the dendritic tree, not real neurons. I am not an expert in that field but you should look at Boris Gutkin's work who is presently at Moscow. As I understand the idea of parallel computing, the idea of massive parallelism is to reduce the (computer) node sizes while maximizing connections between nodes. If you look at the evolution of supercomputers, initially they were build of very powerful superscalar processors. But, as time goes, they are trying to build of more interconnected lighter processors. That is because communication is the bottleneck in the supercomputing. Powerful nodes compute too much information that they need to stand by to receive/send more to/from their (distant) neighbours. It makes no sense to make very powerful nodes, but, instead to spend the machine space to more cabling. Neural networks are the ultimate parallelism machines. Their compute nodes, neurons, are as simple as possible. The paradigm, known as connectionism, means that computation is achieved through emergence of results when simple nodes communicate with each other. It consists mostly of cables. In NN the computation is made by thouthands of inter-neuron synapses rather than neuron itself. The idea is that you should connect directly with as much other neurons as possible. You can consider a number of connected neurons as one neuron (subnetwork) but why and, for sure, you do not want to isolate any neurons by a physical wrapper to force them to connect only to each other and prevent possible connections the rest of the neurons. It seems unnecessary, difficult to implement and not only wasteful but adverse limitation. There is hardly a room for other (sub)neural network in the neuron. You may decide yourself, analyzing the function of neuron how can you implement it. As far as I know, biologically plausible spiking neurons are made of simple capacitor+resistor+something firing a spike if capacitor charge exceeds some threshold. Nothing indicates that you either can fit another neural network into the neuron or need it to simulate it. Why not to hypothesize existence of humans inside the neurons or smaller heads in human head? A head, made of other heads can give more power. Not the answer you're looking for? Browse other questions tagged neuroscience theoretical-neuroscience neural-network neurophysiology or ask your own question.